IBM, however, is the company going big and bold in championing the benefits of technology driving work efforts to retain the best, the brightest, the most apt to contribute something to the conference table. IBM CEO Ginni Rometty touted IBM's successful use of AI for leading the workforce at CNBC's @ Work Talent + HR Summit. She sat down with Jon Fortt and delivered some impressive numbers on how the IBM's AI tool helped the company. 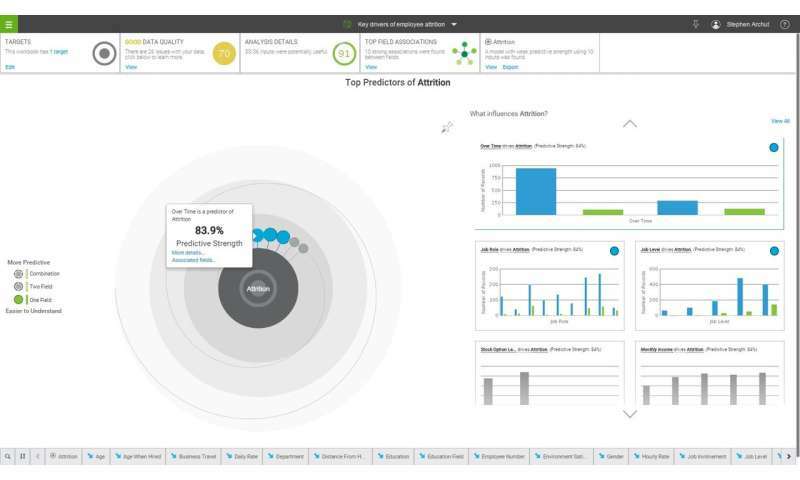 First, though, let's run a flashback to the old days of Watson in the limelight when Forsyth Alexander in 2016 in a blog said HR people could use Watson Analytics to know what factors can be changed to hold on to good finds. Alexander walked readers through what lightbulbs can turn on once the HR-curious logged in to Watson Analytics. "I ask Watson Analytics what drives attrition, because it's the most interesting to me, and I want to see how the other fields statistically relate to that target. It looks like working a lot of overtime is strongly linked to attrition." She then had Watson show her predictive information "on how job role and performance evaluation relate to employees who have left." Sure, some insights on triggers that a worker will leave that she saw may seem obvious– people who work a lot of extra hours without being rewarded and attrition in sales jobs being higher than other areas. 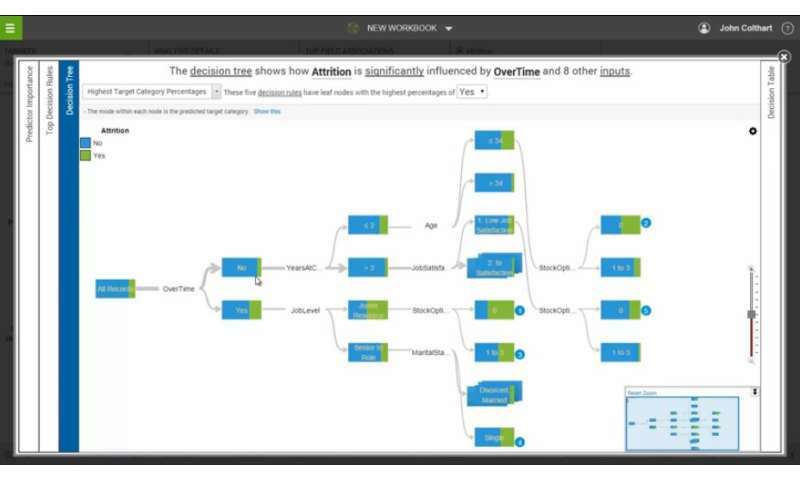 "What Watson Analytics does is quantify these insights reliably." That way, she said, a company can take focused actions based on factual insights. Fast-forward to 2019 and IBM is still talking up AI's potential for human resources insights and, regarding accuracy, the numbers being touted are impressive. CNBC said IBM HR now has a patent for its "predictive attrition program" which was developed with Watson to predict employee flight risk and prescribe actions for managers to engage employees. CEO Ginni Rometty in 2019 talked about this "predictive attrition program." Eric Rosenbaum, Editor, CNBC.com, said the AI retention tool is part of a suite of IBM products that are designed to upend the traditional approach to human resources management. IBM artificial intelligence can predict which employees will leave a job with 95 percent accuracy. The tool feeds into an overall strategic view at IBM of changing the human resources function from service to growth engine. She also said, you have got to put skills at the center of the culture. An article in Forbes relays an understanding of the proactive retention of people. "IBM's talent strategy also involves the proactive retention of people. Its HR AI system accurately predicts 95% of the time if people might want to leave the company. 'It has saved the company over $300 million,' said Rometty, specifically due to proactive retention practices. It's the artificial intelligence that tipped off IBM executives to take action—be it adding more compensation, skill development or a job change—before the employee might have left." How does this AI tool work? Seriously, how does it work? Several reports said they had not found specifics behind how this AI works. "Indeed, given all the hype over A.I. and machine learning, it's easy to forget these aren't omnisciently wise systems...and HR processes are generally far more sophisticated, with a tricky human element." On the other hand, it is not easy to dismiss Rometty's insights about employee focus and fairness. Have all managers in your experience kept an eye out for your professional growth? "Among the tasks that HR departments and corporate managers have not always proved effective at, and where AI will play a bigger role in the future, is keeping employees on a clear career path and identifying their skills," said CNBC.com. "Rometty said being transparent with individual employees about their career path is an issue in which many companies still fail." Regarding formal skills assessments. managers can be subjective in ratings. Nonetheless, human resources as a human function with AI in the mix is a testy subject for some workers and it was not surprising to see thoughtful reader comments in TechSpot. "If only we could predict when 'that next guy' is loading his AR-15 and getting ready to do something terrible," said one reader. And this one: "As for what this AI is looking at, they say people don't leave companies, they leave bosses." Perhaps the last word on this belongs to Don Pontefract in Forbes: "Artificial intelligence is a must for any HR team if it wants to survive not only the pending talent war but its long-term existence, too. The big question is whether it will put that technology to good use to assist all employees, or will it simply be used to trim costs and total headcount numbers."